Cologne downtown hostel kohteessa Köln, Saksa: Varaa nyt! 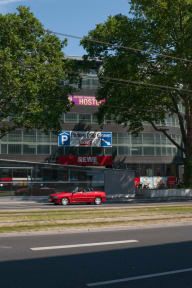 You will find the Downtown Hostel right in the heart of Cologne. Be right in the middle of big city life and experience the best Cologne has to offer. The central location offers walking distances to all of the most important sights and points of interest. Relax and take in the view from our balcony after a long day of shopping on one of the longest shopping promenades in Germany. Right in the city centre you will find the Downtown Hostel with a view of the most important sight: the cologne cathedral. The main train station is just a few minutes walk from our front door and we will welcome you at our 24h reception. From our excellent location in the middle of the city, you are a few minutes away from many places of interest. 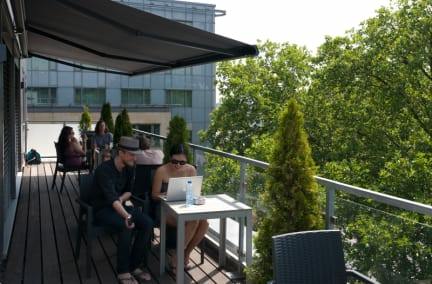 Art and culture, bars and clubs as well as shopping on one the largest shopping promenades in Germany – our Hostel is the perfect access point for everything Cologne has to offer. Numerous bars and restaurants are right around the corner. However, if you are not in the mood to go out, there is the possibilty to get groceries in the integrated supermarket on the ground floor and to cook a meal in the Hostel’s kitchen. We have 2-bed private rooms with a bunk bed and dorms (4 bed mixed, 6 bed mixed and 8 bed mixed). All rooms have their own private bathroom. Please note: we do not accept bookings of groups larger than 8 people. If you decide to make separate bookings for your group anyway, we retain the right of cancelling your booking without a refund of your deposit. Attention: City-Tax! For private bookings we are obliged to pay a city tax of 5% of the overnight amount per person and night. We have to charge this additional amount at your arrival. Business travelers are exempt from city tax but need to provide evidence. We regret any inconvenience this may cause you and we appreciate your understanding! If you have booked a complete room we charge a deposit of 100 € per room. This is only payable in cash on arrival. One of my favorite , I go often . Clean , modern , lovely .